By Ted Bade, © Copyright 2010, All Rights Reserved. 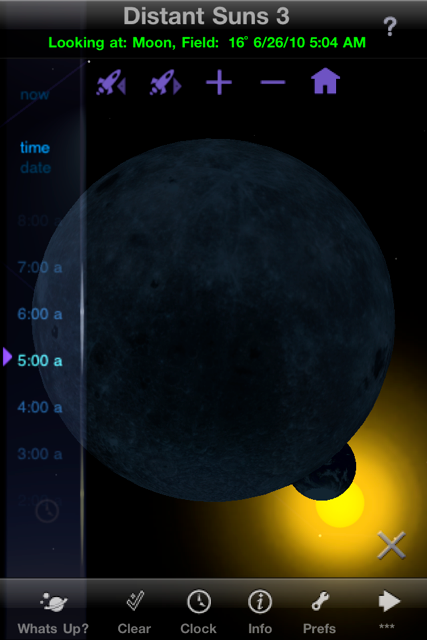 Distant Suns 3 is a nicely designed astronomy program for the iPhone/iPod Touch. It includes lots of information, images, and easy navigation of the skies. It’s an excellent choice for an astronomy buff. This application, which was originally designed for the Commodore Amiga computer in 1985, has been updated to take advantage of all the power packed inside our modern portable devices. Don’t worry about how long this program has taken to reach your finger tips. 25 years is less then an instant in the life of our universe! There are 130,000 objects in the App’s database, 6000 you can see in a good sky and a lot more that require a telescope to see. A lot of information is packed into this App. In addition to the coordinates of all those objects, there are images, text descriptions, and other information about many interesting objects. If you are an astronomy buff, you might have looked at a few of the many astronomy programs that are available for the iPhone/iTouch family. I know I have. There are several things I like about this App including easy selection of objects one can see, images of objects, Easy means of turning on and quickly off labels of objects, and easy to see cardinal point markers. Since it was designed for the iPhone which has a nicer display, GPS, and compass, there were a few features I was not able to test nor take advantage on my Generation 3 iPod Touch. Distant Suns can take advantage of your device’s location services to determine where it is (even using WiFi) or you can tell it where you are by entering nearby city names or coordinates (longitude and latitude). If you have an iPhone, your GPS would also be able to tell it where you are. You don’t have to use your local coordinates, if you want to see what the sky might look like anywhere else in the world. This App will also use the compass feature included in some iPhones, so as you move, so will the view. After the App starts, you are presented with a slice of the sky facing north at the coordinates that you entered for a location. The time starts with that of the iPod and you can change the time and/or date to anything you like. Your point of view can be easily changed by swiping along the screen. Cardinal point markers scroll along the bottom of the screen to keep you oriented. The sky below the horizon can be visible or invisible. If you like, an image can be used to cover the areas that would be below the horizon. The image also gives a realistic view of the sky, since few of us are blessed with a clear horizon to horizon view. For more information on any object on the screen, you just tap the screen twice, a new cursor appears, now moving your finger on the screen moves this cursor. When the cursor moves over an object on the screen, it locks on the object for a moment and basic information about it appears on the bottom of the screen. Leave the cursor on the object and click a button labeled “More” to bring up a lot more data about the object, usually including an image. The App includes images of a great many of the deep sky wonders. There are a number of preferences that control how the information on the screen is displayed. Here you can tell the App to show names or numbers for a variety of different objects like stars, galaxies, nebula and so forth. You can also turn on or off constellation information. A very useful button turns off all labels, in case you need to see a natural sky, but doesn’t change the preferences. Which means a second click of this button turns everything quickly back on. The bottom of the screen provides three different sets of functions that let you control Distant Suns. Quick movement to the major cardinal points, compass information if your iPhone has that feature, and a tour guide (more on that below). The next set has links for setting the clock, various preferences, and more. 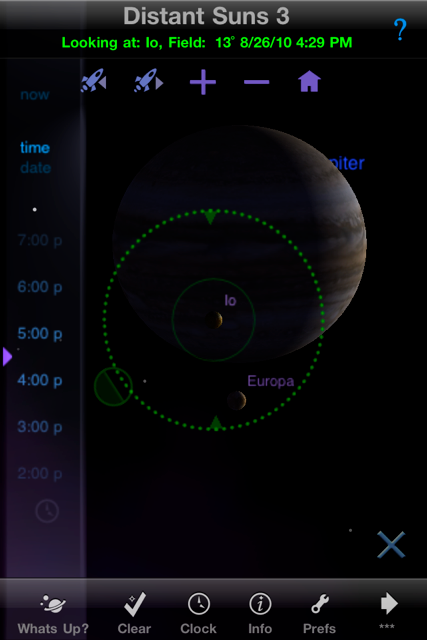 A feature called “What’s Up”, gives a quick chart of which planets/moons are currently above or below the horizon. The final set provides search functions. The tour guide is a very useful tool for observing. It shows where, in your sky, the current best viewed objects are to be found. After you start the tour the image centers on the first item. Just as if you selected the object, a small window appears at the bottom with some basic information and a button linking your to a lot more. If the tour object is a constellation, it shows the classical drawing and the names/numbers of the major stars. When you click on the next (or back) arrow, it moves the view so the next object is centered, arrows on the screen hi-lite the location of the object. The search section of this program is limited, but in a very effective way. Here buttons provide links to menus for the moon, our Sun, the planets, constellations, and “other” (deep sky wonders). Select one of these items and you are presented with a menu listing related objects. 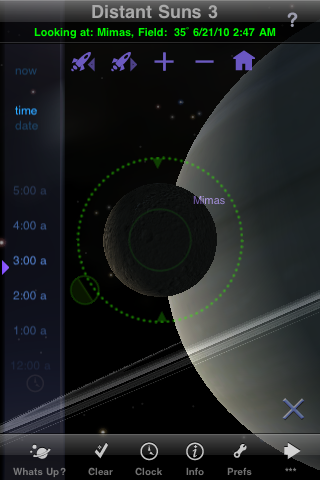 For instance, selecting planets provides a list of planets and their moons. Click on the name to show the planet on the screen, select a rocket ship icon to go to a view near the object, or click on the arrow for more information and a picture. For other types of objects, the choices are related to the object. For instance, you don’t get to fly to a constellation, but you can get a view of it and the classical image associated with it. Of course, you can explore the sky manually, by turning labels on and off to see what is located in various parts of your sky. If you are lucky enough to live in an area with dark skies you might even see some of the brighter objects. While you can shift the device into a landscape view, when you do you loose all the menus and controls. In this mode, you can scroll the sky but not change time or select an object, etc. I like this view better, but the lack of menus hampers it. Overall, I think Distance Suns 3 is a very good choice for an astronomy App. I really like the fact that it provides not only a lot of information about objects, but an images as well. This could be enhanced, of course, if links to sites with even more information were provided, especially now that multitasking makes it easy to switch back and forth between the browser and an App. If you are considering an Astronomy app for your device, definitely consider Distant Suns 3. I hear from the developer that this program looks awesome on the new iPhone/iTouch displays. I can only imagine that it would look equally better on the iPad.